President Abdulla Yameen on his official trip to GDh. Faresmaathoda. President Abdulla Yameen Abdul Gayoom on Tuesday vowed to increase the retirement age in Maldives to 74 or 75 years of age. Speaking at the ceremony held to mark the completion of the beach protection project at Faresmaathoda, Gaafu Dhaalu Atoll during his ongoing official trip to Huvadhu, Yameen stated that, based on the changes to Maldivian lifestyle and health awareness, he did not believe 65 years should be the maximum retirement age in Maldives. Vowing that he would propose the parliament to increase the retirement age by another 10 years, Yameen also assured that the government would make arrangements for people over the age of 65 who are already retired. The president also defended the amendment made to the Constitution during his regime, which renders those over the age of 65 ineligible from running for presidency. Declaring that the amendment was not tailored to bar any specific individuals from contesting in the presidential election, Yameen likened the nation to an engine and stated that a country runs on the strength of its youth, much like how a machine needs to swap out an old engine for a new one. During his visit, the president also pledged to make the atolls of Gaafu Dhaalu and Gaafu Alif tourism hubs. He shared that 15 islands close to Faresmaathoda are to be developed for tourism with a total bed capacity of 3,000. 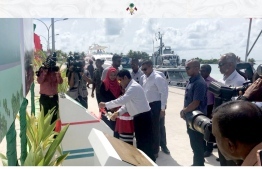 The president also touched upon the mega housing project 'Villimale 2' recently announced by the government. The president had vowed last week that by July 26, 2030, every individual aged 18 and above would receive a flat or land plot no smaller than 1,000 square foot. However, Yameen assured in his address at Faresmaathoda that the new housing scheme did not mean that the government was compelling people to relocate to the Greater Male region. He declared that while anyone who wished to do so was welcome to migrate to the capital city, which he described as belonging to everyone, those who wished to remain in their home islands would receive employment opportunities and income as well.